Did you know that the little plastic tips on the end of your shoelaces have a name? Of course they have a name, everything has a name right? But, there are some things we can go a lifetime not knowing the name of, like the name of the little plastic tips on the end of your shoelaces. 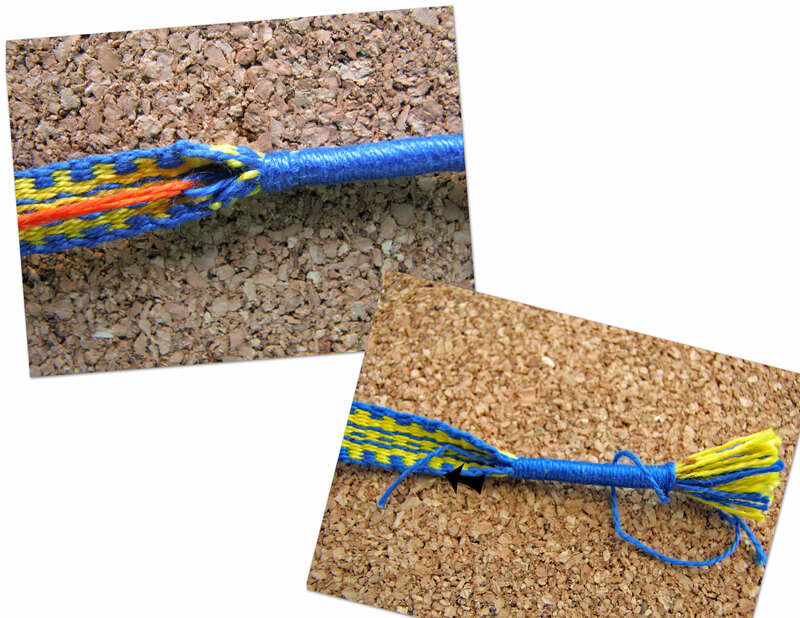 While investigating, I came across a post on the blog A Spinner Weaver, written by fellow inkle weaver Annie MacHale, about a pair of shoelaces she wove and the dilemma of how to finish the edges. 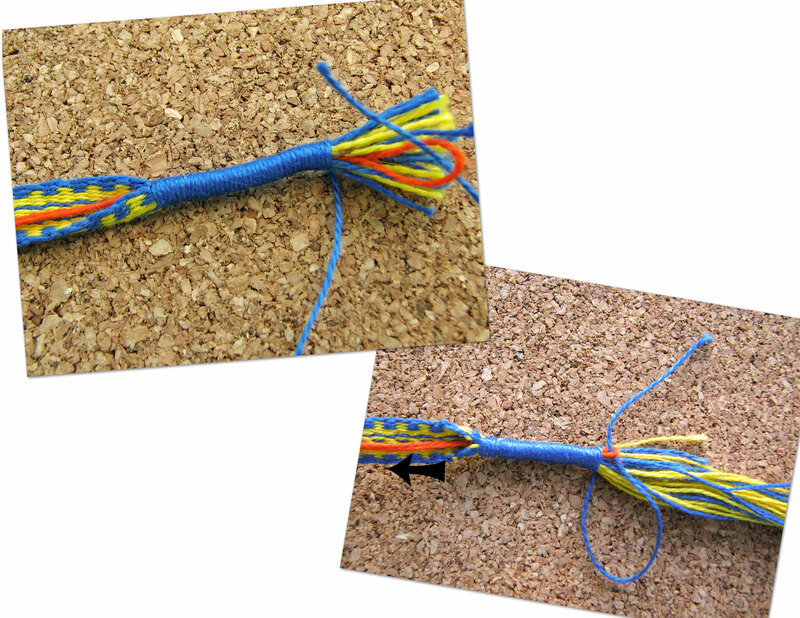 The discussion in the comments section of the post sparked the method I came up with for making my shoelace tips. Take a look and let me know what you think. 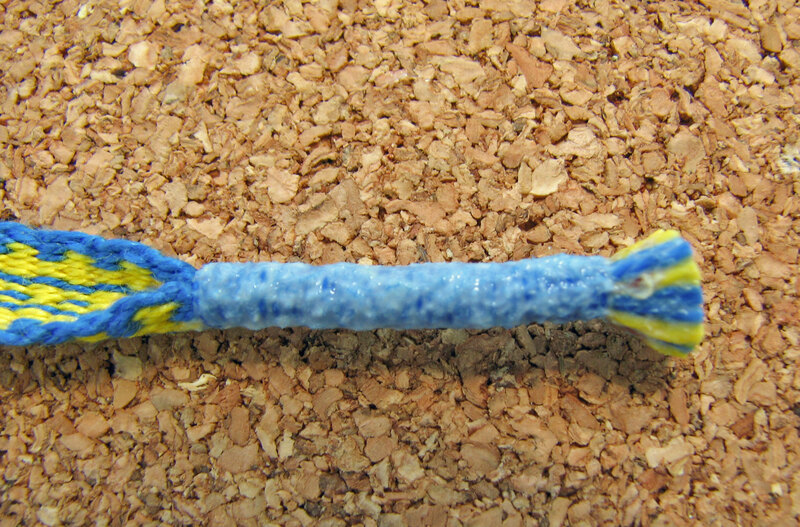 -10/2 mercerized cotton (to weave the laces and wrap the tips). 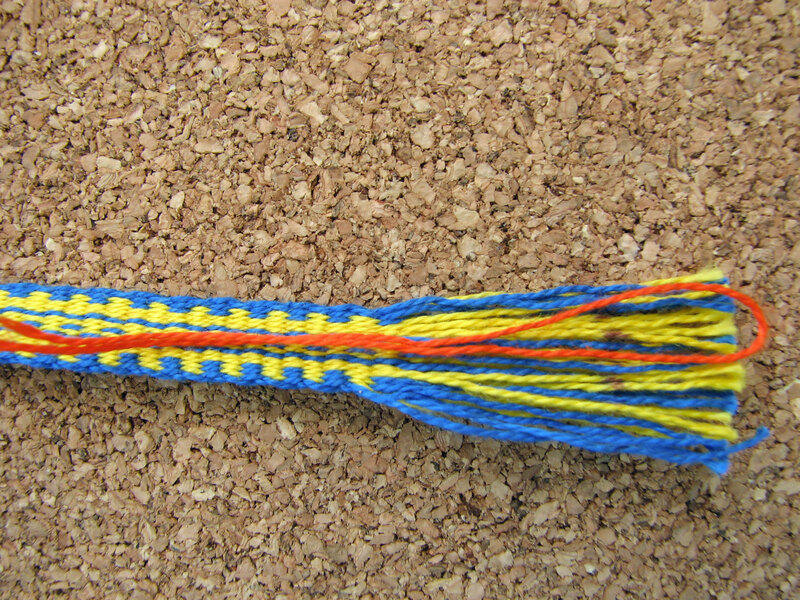 My laces have 30 warp ends – 15 heddled and 15 unheddled. -heat gun/tool (I tried a hair dryer, but it just doesn’t get hot enough to shrink the plastic tubing thoroughly. It would come off with a bit of a tug. So, I bought a Darice brand heat tool at Joann Fabric and Craft Stores with a 50% off coupon – Yay!) *I don’t suggest using glue. It scorched under the plastic tubing from the heat. 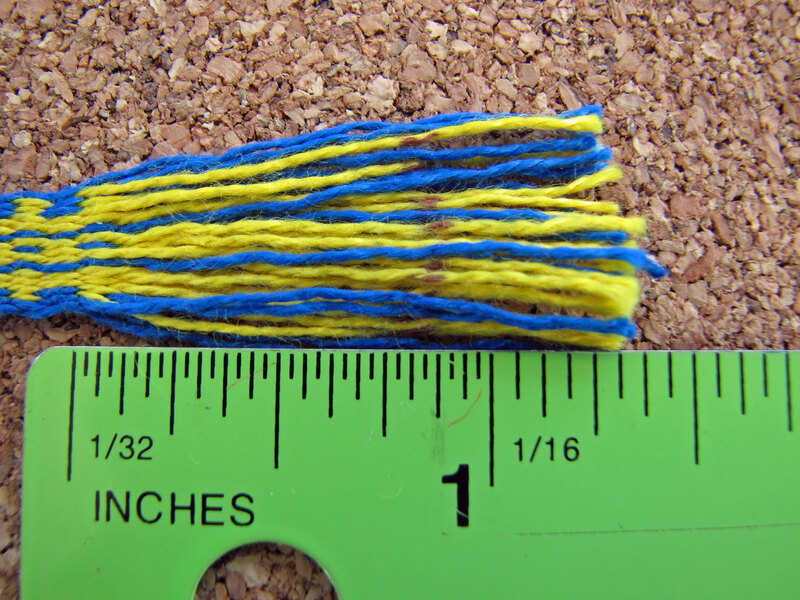 Measure, mark, and cut fringe to desired length of shoelace tip plus at least an additional 1/2″. You’ll need this to hold onto. 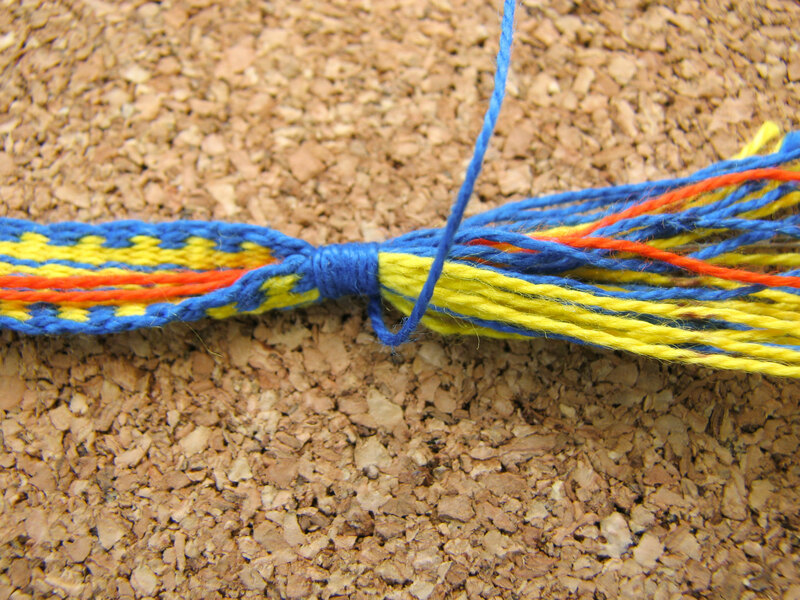 Lay a loop of thread or yarn about 6″ long, down the center of the fringe and shoelace. This will be used to secure the tail of the wrapping at the end. Wrap a piece of size 10/2 yarn, about 16″ long, tightly around the fringe, being sure to start at the last row of weaving. 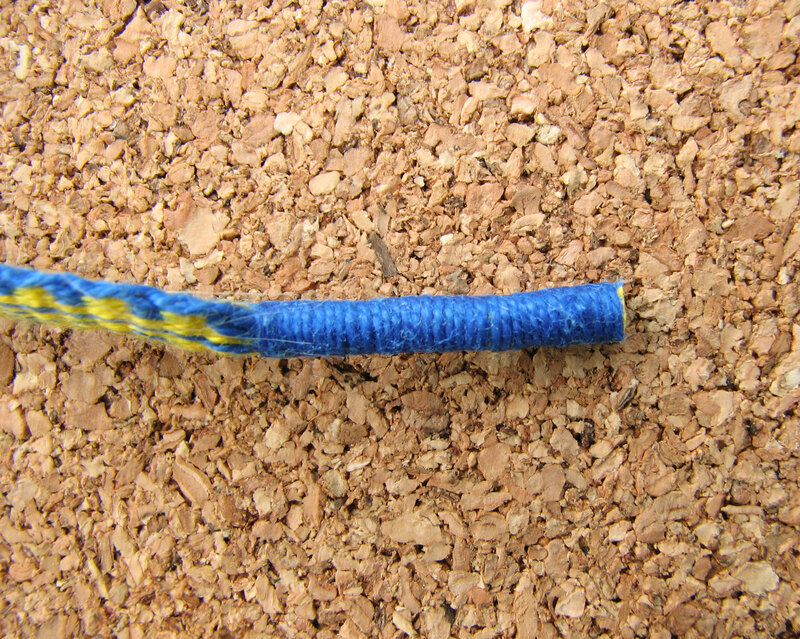 Once you have wrapped to the desired length, insert the tail into the loop as pictured. Pull the loop (orange yarn) until it goes under the wrapping. Continue to pull the loop until the tail comes out the bottom. When you pull the tail all the way through, the top should settle in and be neat and snug. Closely clip the tail. Trim the fringe to approximately 1/4″ above the top of the wrapping. Dip the tip into the bottle of fabric stiffener. Do not shake off the excess. It will dry clear. Once the tip is dry, use the rotary cutter to slice off the fringe. This gives a nice clean edge to feed into the tubing. Cut a piece of tubing 1/2″ longer than the tip length. Insert the tip into the tubing. You will need to twist, push, pull, shove, and cajole the tip into the tubing. It is a tight fit. This is what helps it stay without glue. After the tubing is on, cut it down to be level with the top of the tip. 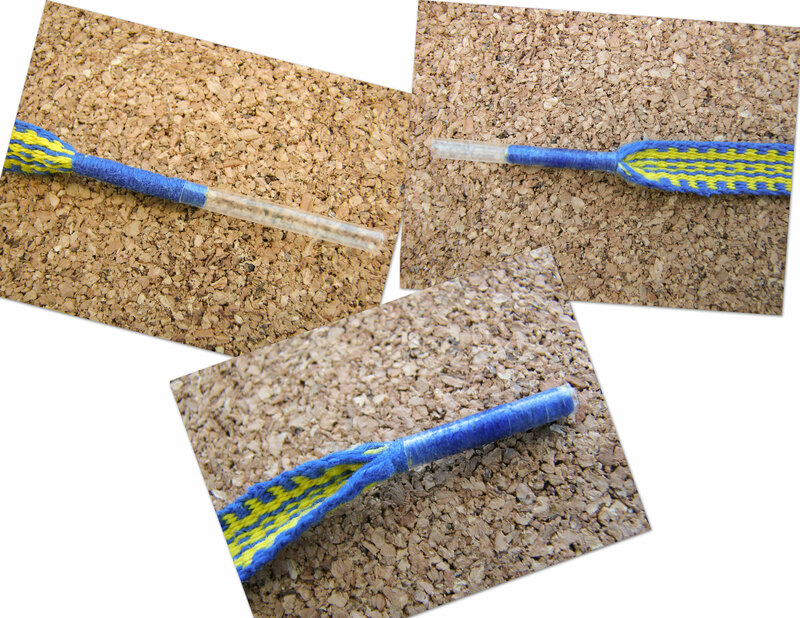 Shrink the tubing with the heat tool, being careful not to burn the shoelace, tubing or your fingers!. 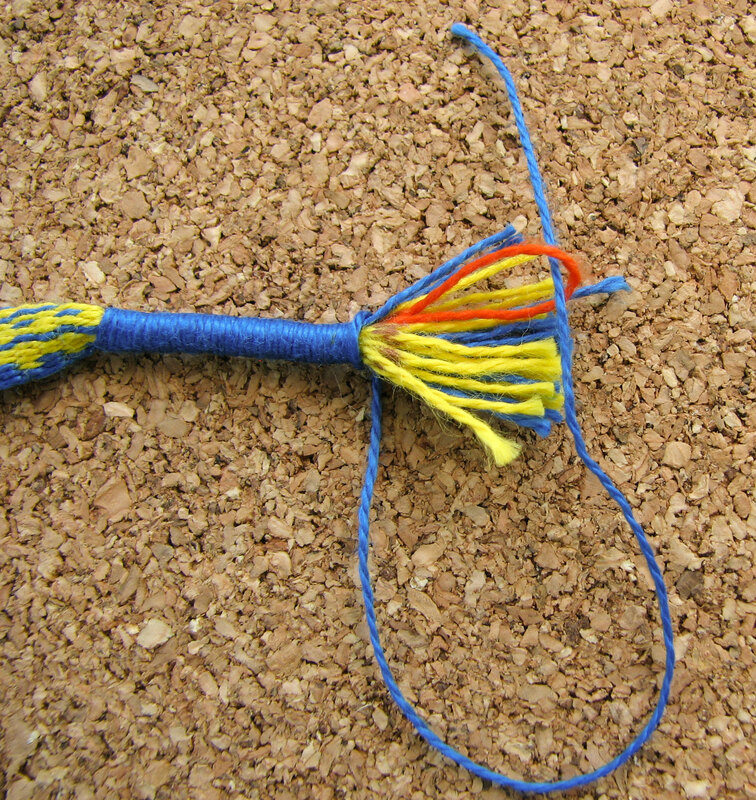 You are finished and have a beautiful shoelace tip. 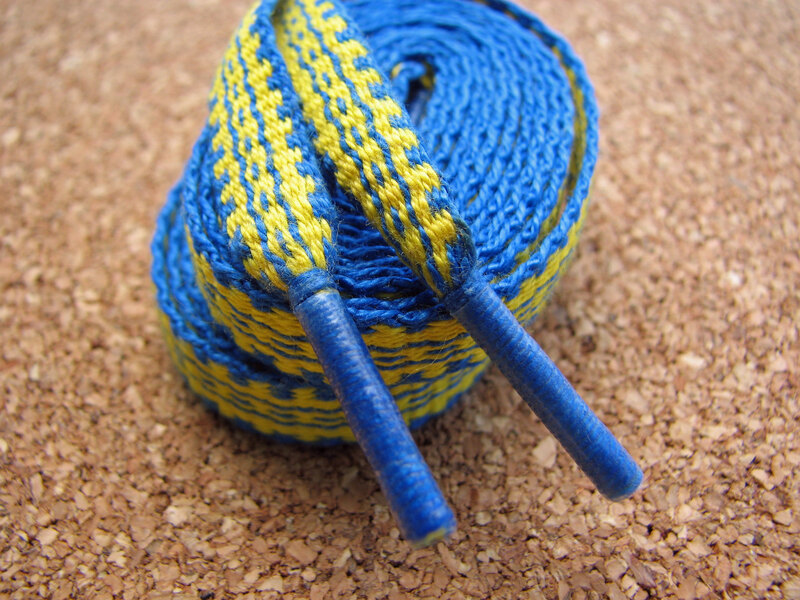 If you are looking for information on how to weave a shoelace, the article by Brianna Lancaster, daughter of talented weaver Daryle Lancaster, on Weavezine is very good. 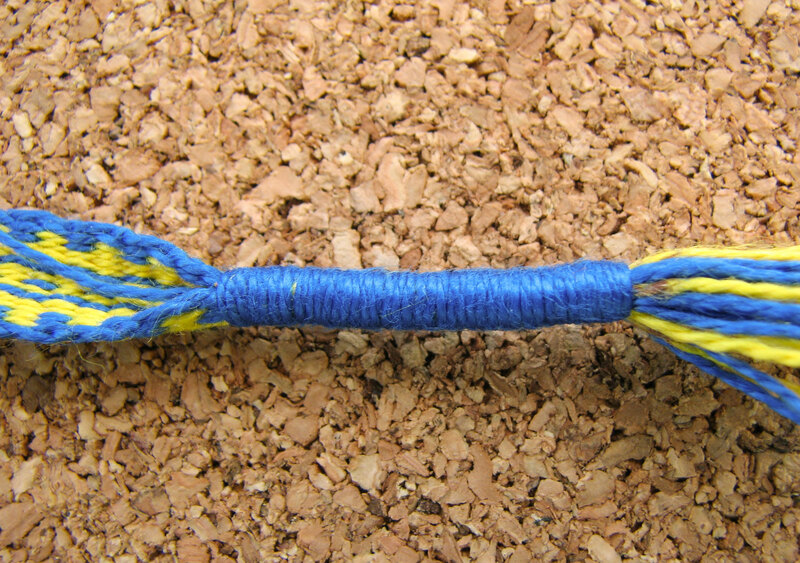 Also, I found this site dedicated to shoelaces. Fascinating stuff. How have you ended your shoelaces? Do you have any tips or suggestions? This is too perfect, Dixie! Excellent! I was wondering how you made your “aglets”. And I didn’t know the name! Now I do and I might be able to help my husband when he comes to me with fiber related cross word questions as he sometimes does. Fun – and beautiful. Your laces are so lovely. Your photos and instructions are so clear. What is that lovely material in the background? Cork? And the other resources you shared are very interesting. Thank you. Isn’t it amazing all the information in the world! Aglets… who knew?! You have good eyes! It is cork. I tried taking the pictures on white but they just didn’t look nice. Thanks for this post and perfect timing! I have my first attempt at laces on the inkle loom right now and was wondering about this… I especially love the wrapped ends under the aglets. Good luck with your laces. I can’t take full credit for the wrapping idea. Others have done it too, but I like the way it looks wrapping tge ends with the yarn from the laces. But you could use embroidery floss for a pop of color. Are on on instagram? I’d love to see how yours turn out. Thank you for this great tutorial. I am thinking of making my husband some shoelaces for his work-boots, because we can never find the right size for him. Phineas and Ferb did an episode on it, so I learned from my kids’ show! Aglets are cool. That episode is too funny. If you scroll to the to of the comments in this post Dixie left a link to the video. It was the first time I had ever seen the show. It kept me laughing for sure! Thank you, Judith! I like your idea. They indeed would add a classy finish to a hat band. I have done this before, but instead I weave in the round at the beginning and end of the band. At the time I didn’t have shrink wrap tubes for my woven shoelaces but they held up really well just with glue and weaving the ends in the round. Hi Brandie. Don’t be sad, half the fun is seeing what comes of our weaving. The band you made may not work for shoelaces but is definitely perfect for some project as yet to be determined! As for the yarn, #10 crochet yarn is thicker than 10/2 pearl cotton, which is what I used at 30 total warp ends. I order my yarn online from Lunatic Fringe. If you cannot do so, tatting yarn is a good weight also. I’m not sure about the tubing sizes or thicknesses. Maybe you can call them and have them send you the size I used? Good luck and don’t be sad. Weaving is fun, even when the project has a mind of it’s own!